Any West Virginia resident with a bank account, a credit card, a car loan, a mortgage, or an insurance policy has the right to have their information protected. Banks, financial lenders, and businesses obtain a lot of sensitive financial information when a consumer opens an account or seeks a loan. The Gramm-Leach-Bliley Act of 1999 (GLBA) was enacted by Congress to make sure these financial entities protect your information, and to ensure that the information is not shared with third parties without your consent. The lawyers at Paulson & Nace, PLLC, know consumer privacy laws. A West Virginia consumer protection attorney at our firm helps you hold violators of the consumer protection laws, including the GLBA, accountable. The banks, lenders, and other companies have the resources to keep your personal financial information safe. When these businesses violate the law, we sue to enforce the law and make the violators pay damages. The GLBA is also known as the Financial Services Modernization Act of 1999. GLBA compliance is mandatory. Every financial institution must have a policy in place to protect the financial information of clients. Financial institutions include non-bank mortgage lenders, banks, tax return preparers, debt collectors, real estate settlement companies, real estate appraisers, loan brokers, and other businesses. The GLBA applies to consumers that establish a relationship with a particular financial institution. Examples of customers include people who are: opening a bank or credit card account, obtaining a lease for a car, getting a mortgage loan, or other situations. The Financial Privacy Rule. This Rule requires that financial companies give consumers a privacy notice when the consumer relationship begins and on a yearly basis thereafter. The notice must tell the consumer how the data is collected, how it is shared and used, and how the financial institution is protecting it. The Safeguard Rule. This provision holds that financial institutions must have a written security plan describing how the company is protecting consumer information. The plan has to provide for at least one employee to manage the safeguards. The plan has to include a risk analysis, programs that have been designed and tested, and must change the safeguards as technology changes. Computer firewalls and encryption techniques are examples of safeguards. An opt-out provision. The privacy notice should tell the customer that he or she can opt-out of any sharing of the information with third parties and explain how the customer can opt-out. Financial companies must also work to prevent outside parties from obtaining your personal financial information through fraud, false statements, or other deceptive means. Paulson & Nace knows that laws are worth little unless they are enforced. Our consumer protection attorneys enforce the GLBA by brining civil lawsuits to those who violate the terms of the Act. We also work to assert that criminal penalties should apply. Our West Virginia office has an attorney ready to help you bring a legal claim for violations of the GLBA through other consumer privacy laws. If you think your financial data was compromised, our skilled and successful trial lawyers are ready to advocate for you to get the protection your financial information deserves. Protect your financial data by contacting a West Virginia consumer privacy firm. Your financial information is private to you. It should not be used without your permission. If your information is being used against you, it may be due to a violation of the Gramm-Leach-Bliley Act. 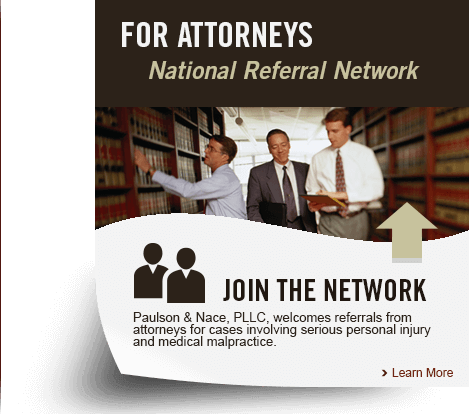 Paulson & Nace, PLLC’s distinguished family of attorneys is widely recognized throughout West Virginia for both our comprehensive legal services and our aggressive advocacy. When you choose a consumer protection attorney from our practice to represent you, you are choosing a team that values families and family relationships. Please call 304-741-8079 or fill out our contact form to tell us your story in a no-obligation consultation. Our office is located at 3501 Maccorkle Ave SE, Charleston, WV 25304.